The evolving list of the “fastest growing” companies demonstrates how quickly and successfully entrepreneurs are able to grow and scale their ideas and challenge industry leaders by rising to the top. Join Cigniti’s webinar on Securing Mobile Applications by Chakri Devarakonda on Wednesday, September, 2013 3:00 PM IST. The webinar will help you understand how to increase the security of your mobile app and provide insights on the common attack possibilities on a mobile. The session also includes a live demonstration of mobile application security testing. The webinar will help you identify factors for selecting the right mobile test automation tool, performing ROI analysis for mobile test automation efforts, developing test automation scripts on mobile native apps including the pitfalls and best practices in mobile test automation. • How to build a flexible and scalable mobile test automation framework? • What not to do while designing mobile test automation frameworks? • How to build a device agnostic mobile test automation framework? • How to achieve the right balance between Mobile Test Automation and manual testing? • How to translate client requirements into objectives for designing the framework? • How to bridge the framework and the business environment? • How to gear up for Hybrid, Native and Web apps? Target Audience for the session: QA engineers, QA Leads, QA Managers and QA Architects specializing in the test automation of Mobile, Web Apps for ISVs and Enterprises. Cigniti COO Raj Neravati will speak on ‘Perspectives and forecast on Testing Phase II of IV and V (Independent verification and validation)at SteP IN SUMMIT 2013 in Bangalore. The session will be held on June 21, 2013 from 3.15 pm to 4.15 pm. Building Cloud Based Performance Test Lab: An experimental workshop at SteP-IN SUMMIT 2013 by Rahul Goel, Senior Manager at Cigniti Inc. The session will be held on June 19, 2013 from 11:15 am to 1.15 pm. HP Discover Las Vegas is the must attend-conference of 2013 featuring over 500 sessions focused on the hottest topics in the industry today – Big Data, Converged Cloud, Mobility, Security, Risk Management and more. Visit Cigniti + Gallop at booth #2158B. As part of the Tech Series NASSCOM introduces the 5th Event on “Quality Assurance and Testing”. Sai Chintala, SVP - Global Presales, Cigniti will leading a Panel Discussion on Effective methods of QA in a fast changing environment at the event. Today businesses are leveraging agile software development methodologies to ensure a continuous but ready to use software for customers at extremely fast paced intervals of time to sustain business commitments. Hence the ability to ensure optimal test coverage of business processes is essential. Generation of smart test scenarios that covers the multiple paths of business logic is very crucial. Test case design constitutes a large part of testing cost. It is generally agreed that manual testing is becoming a bottleneck and is a frequent cause of project delays especially for large programs. Therefore, automatic test case design is essential to ensure the quality of large software products and to contain the rapidly growing testing costs. Businesses are struggling to grapple with the growing phenomenal information explosion. Conventional database systems and business intelligence applications have given way to horizontal databases, columnar designs and cloud-enabled schemas powered by sharding techniques. QA becomes equally challenging as BigData is still evolving and it might take few more years for us to see products / tools for testing BigData. The objective of this session is to provide TestLets which can be sought as point-solutions for specific problems. The TestLets focus around data acquisition, data cataloging, data sampling & quality in real time. 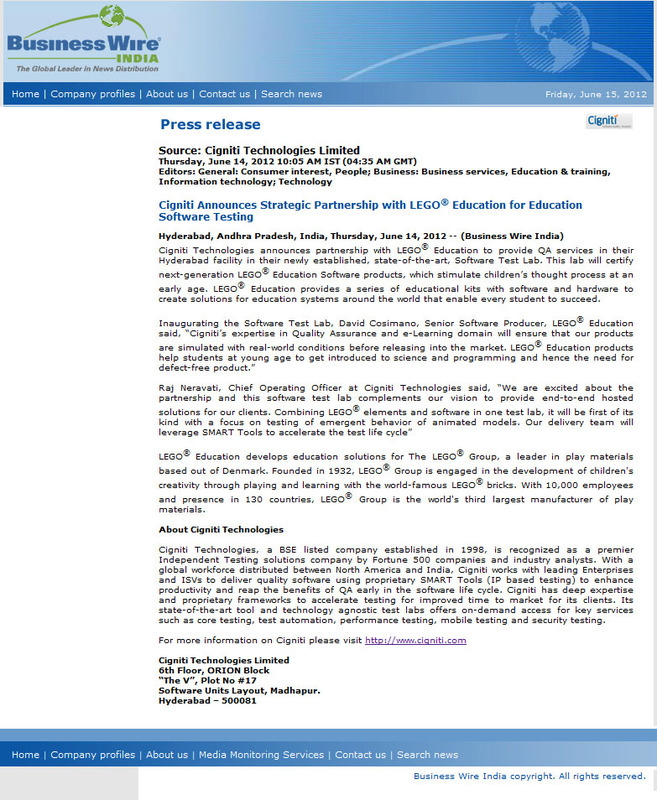 Mr. Neravati is Chief Operating Officer of Cigniti Inc. In this capacity, Raj is responsible for leading our global sales, delivery and overall operations to drive organic growth. Raj will provide leadership and guidance for company's vision of helping clients build and deliver software with predictable outcome. Prior to joining Cigniti, Raj worked at AppLabs Inc as Senior Vice President responsible for Global Delivery Operations. Raj is an industry speaker and has pioneered several models for establishing Test Center of Excellence. With a vast experience in Six Sigma, TMM and Prince2 methodologies, Raj has defined CXO dashboards and proprietary frameworks to translate delivery metrics into a business value. The 11th Annual International Software Testing Conference (STC 2011), organized by QAI in association with Edista Institute (ETI), will take place from 01 - 02 December, 2011 in Bangalore. In its 11 th year, STC 2011 focuses on the theme of Testing Enterprise 2.0 - Getting Ready for the Quantum Leap 2011 - Year of 25th Anniversary of Quantum Computer. In the current world of continual change, computing has become complex and extremely inseparable from our daily lives. In fact, today our lives depend of computing so much than ever before making the need for testing very imminent. Building on the theme, STC 2011 focuses on building a narrative to piece together the three corner stones of future business opportunity, growth and continuity - Innovation, Institutionalization, and Inorganic Growth. The focus of the Testing Enterprise 2.0 is to focus on the ability of the organizations, practitioners and leaders to adopt, learn and lead in the wake of the new paradigms. It has become imperative for organizations to rapidly and efficiently adapt to changes. Practitioners are forced to examine challenges holistically rather than reductively to understand relationships to better frame the solutions. At the conference practitioners, organizations share and learn the current best practices, and the future possibilities on how to manage not only Agility and Achievement, but focus on adapting and taming the new challenges of change. Why Enterprise Mobility Testing Conference ? Companies are now looking at Enterprise Mobilityfor functions like ERP, CRM, SCM, sales force automation, unified communication and billing. Departments like HR, retail, customer service, finance and field service too will look to mobilize in the next 24 months. Almost all OEMs are coming up with innovative tablet offerings to tap the fast growing market e.g. Apple, Blackberry, Samsung, Motorola, Acer, HCL, Beetel, G’Five, Huawei etc. 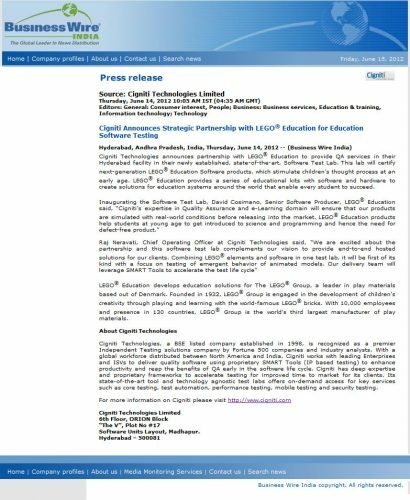 Cigniti Technologies announces partnership with LEGO® Education to provide QA services in their Hyderabad facility in their newly established, state-of-the-art, Software Test Lab. These are exciting times to be part of software industry. There are tectonic shifts underway, such as, move to cloud applications, proliferation of mobile and handheld devices, and global delivery models for software services. Change is always difficult and it requires leaders who can successfully drive the change. STeP-IN SUMMIT 2012 is the perfect platform to keep you abreast of the latest trends in software testing, share your experiences with peers and learn from the industry veterans to hone your leadership skills in business, technology and management. The two-day SUMMIT offers a rich mix of Keynote addresses, plenary sessions, technical tracks, panel discussions and open house discussions to keep you fully engaged. STeP-IN Forum is proud to announce the 2nd edition of its Software Testing Conference at Hyderabad 0n September 14-15, 2011. This event aims to bring together Test Champions and Gurus to share their knowledge for the benefit of Practitioners. This Conference is a platform where academicians and professionals come together to share their knowledge, allowing practitioners to leverage experiences and practices on performing effective testing, using both resources and test automation tools effectively. In brief, it covers Test related Technical areas, Test Automation related aspects, and Test Management related insights.